New Delhi: Shri J P Nadda, Union Minister of Health and Family Welfare inaugurated the ‘4th Global Digital Health Partnership Summit’ here today, in the presence of Shri Ravi Shankar Prasad Union Minister of Law & Justice and Electronics & Information Technology and Health Ministers from several countries. The global intergovernmental meeting on digital health is being hosted by the Ministry of Health and Family Welfare in collaboration with World Health Organization (WHO) and the Global Digital Health Partnership (GDHP). Mr Upendra Yadav, Deputy Prime Minister and Minister for Health, Nepal, Dr Tawfiq Al Rabiah, Minister of Health, Kingdom of Saudi Arabia (Video Address) Mr Zahid Maleque, Minister of Health and Family Welfare, Bangladesh, Ms Lena Hallengren, Minister of Health, Sweden, Dr Arlindo Nascimento do Rosário, Minister of Health, Cape Verde, Dr Ulana Suprun, Minister of Health, Ukraine Mr Faizal Cassim, Deputy Minister of Health, Nutrition and Indigenous, Sri Lanka Mr Biggie Ganda Butale, Assistant Minister of Health and Wellness, Botswana, Dr. Shah Mahir , State Minister of Health, Maldives and government officials from over 35 countries were also present at the inaugural session. Shri Ravi Shankar Prasad Union Minister of Law & Justice and Electronics & Information Technology spoke about the use of technology innovations in transforming healthcare. He highlighted the various initiatives of the Government towards digital healthcare. He said that India is committed to reaching the last man in the line through digital health interventions and digital inclusion. “Digital governance is good governance and bridging a digital divide must be achieved through technology that is low cost,’ he added. 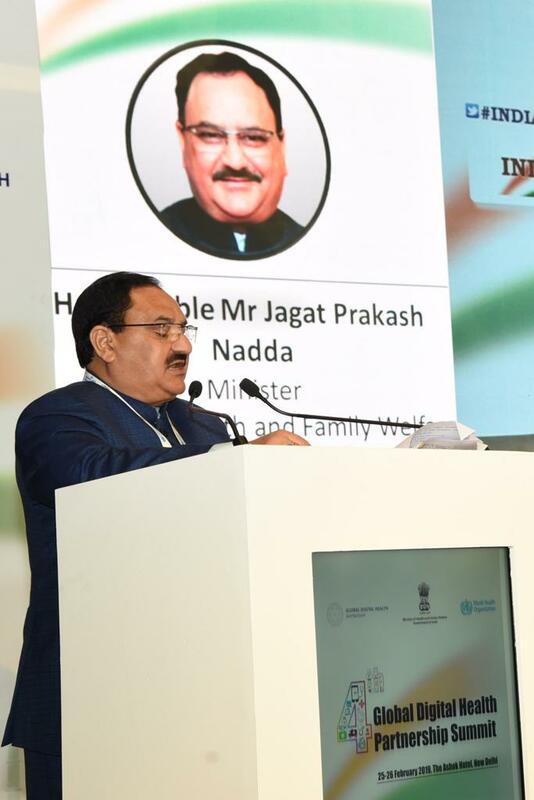 Shri J P Nadda, Union Minister of Health and Family Welfare said that the entire healthcare system in India and the world is undergoing a rapid transformation. “The way we know of healthcare being delivered and accessed is poised to change for better. The digital health interventions are accelerating this transformation. It has a huge potential for supporting Universal Health Coverage (UHC) for which Government of India is committed,” Shri Nadda stated. Shri Nadda further said that India under the leadership of Prime Minister, Shri Narendra Modi Ji is committed to securing Universal Health Coverage for the underprivileged and deprived section of our society with the launch of a comprehensive healthcare scheme by the name of Ayushman Bharat, with the twin pillars of Health & Wellness Centres (HWCs) at primary and secondary levels of healthcare and PM-Jan Aarogya Yojana (PMJAY) at the tertiary level. “I am happy to share that after the roll-out of ‘Modicare’, in merely 155 days, nearly 1.3 million people have availed the benefits of more than Rs.16 Billion under this scheme,” Shri Nadda informed. Shri Nadda mentioned that Ayushman Bharat is primarily dependent on maximising the use of digital tools for effective implementation and monitoring. The scheme is completely digital wherein all the processes from beneficiary identification to hospital empanelment and settlement of claims are done electronically. Hence all the benefits of the scheme are delivered in a mode that is cashless, paperless & completely transparent for all stakeholders, he expounded. 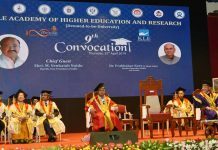 Shri Nadda said that through robust digital interventions the government has ensured that continuum of care across primary, secondary and tertiary facilities get delivered. “We have embraced digital health to achieve the targets of UHC. He further said that a “National Resource Centre for EHR Standards” has also been set up in order to augment facilitation for adoption of the notified EHR Standards. 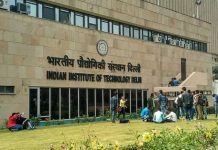 Indian government has notified health informatics standards and approved Metadata & Data Standards for enabling seamless exchange of information across care providers to make these systems interoperable and to build electronic health records of citizens. He added that India took the world stage at the 71st World Health Assembly in Geneva, Switzerland by successfully introducing and unanimous adoption of Resolution on Digital Health. This resolution highlighted global attention to the potential, challenges and opportunities of Digital Health interventions and the need for closer collaboration on the issue globally for countries achieving health-related SDG targets as well WHO’s implementation of 13th General Program of Work. The Ministerial Conclave discussed the implication of digital health interventions to health services accessibility, quality and affordability and explores ways of leveraging digital health technologies to strengthen the healthcare delivery systems globally. The Global Digital Health Partnership (GDHP) is an international collaboration of governments, government agencies and multinational organisations dedicated to improving the health and well-being of their citizens through the best use of evidence-based digital technologies. Governments are making significant investments to harness the power of technology and foster innovation and public-private partnerships that support high quality, sustainable health and care for all. The GDHP facilitates global collaboration and co-operation in the implementation of digital health services. Dr. Poonam Khetrapal Singh, Regional Director, WHO South-East Asia Region (SEAR), Dr. Preeti Sudan, Secretary, Ministry of Health & Family Welfare, Ms Harinder Sidhu, Australia’s High Commissioner to India, Shri Sanjeeva Kumar, Additional Secretary, Ministry of Health & Family Welfare and Mr. Tim Kelsey, Chief Executive, Australian Digital Health Agency, Australia were also present at the inaugural session.